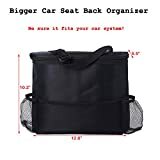 – Organize your car and keep your backseat passengers happy with this convenient seatback storage bag. – Made of durable polyester, this organizer bag comes with enough pockets and compartments to help you stash and stow everything your passengers need to make it through any road trip in comfort. – The zippered main compartment is insulated to help keep hot things hot and cold things cold, and the mesh front pocket allows you to store snacks, playing cards, pens, maps, and anything else your passengers want to keep within easy reach. – Use the 2 mesh bottle pockets to keep water or soda close at hand, and slip a tissue box into the tissue dispenser at the bottom of the bag to keep clean tissues within easy reach. – Simply attach this backseat organizer to the headrest supports on the driver’s or passenger’s side car seat using the adjustable buckled strap to bring both convenience and organization to your car.